After weeks of polls showing Donald Trump gaining on Democratic frontrunner Hillary Clinton’s once sizable lead, for the first time on Monday, Real Clear Politics recorded the New York billionaire ahead in the national polling average. For the period between May 13-19, the presumptive Republican nominee polled ahead of Clinton by a national average of 0.2 points. The new figure places the upcoming presidential contest in stark new light. 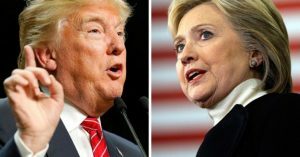 That national average was posted on the heels of two separate national polls which showed the two running neck-and-neck: A Washington Post/ ABC News survey released Sunday has the two in a “statistical dead heat” with Trump ahead of Clinton 46 percent to 44 percent among registered voters; while a survey from NBC News/ Wall Street Journal, also Sunday, recorded Clinton polling ahead of Trump 46 to 43 percent. Perhaps even more troubling, the NBC/WSJ survey found that the negative ratings for the two presumptive nominees are the highest in the history of the poll. Fifty-four percent of those surveyed hold a negative opinion of Clinton and 58 percent have a negative opinion of Trump. At the same time, Democratic challenger Bernie Sanders continues to best both Clinton and Trump in favorability ratings (43 percent hold a positive view of the Vermont senator versus 36 percent who have a negative view) and maintains a double-digit lead over the Republican candidate. NBC/WSJ recorded Sanders ahead of Trump by 15 points.